Why does iHeart Internal Age vary from one recording to another? iHeart Internal Age readings are a measure of Aortic Pulse Wave Velocity (AoPWV). AoPWV is widely used by medical scientists to determine Aortic Stiffness. Aortic Stiffness is a powerful health indicator that is well accepted to predict risk of death from all causes. Aortic Stiffness is a single physiological parameter that is uniquely able to provide an assessment of overall health and estimate lifespan. Internal Age is your age physiologically as compared to your chronological age. As will be explained in more detail below, AoPWV is influenced by both Aortic Stiffness and Blood Pressure (BP). Variation in BP is the factor leading to variability in iHeart Internal Age values. By understanding how to control for BP effects, your iHeart readings will be more consistent and will more effectively show benefits of making healthy lifestyle choices. iHeart performs precise analysis of the fingertip arterial pulse signal to find and characterize a wave that travels down the Aorta and then reflects back towards the heart and continues onwards to the arm, forearm and finger. 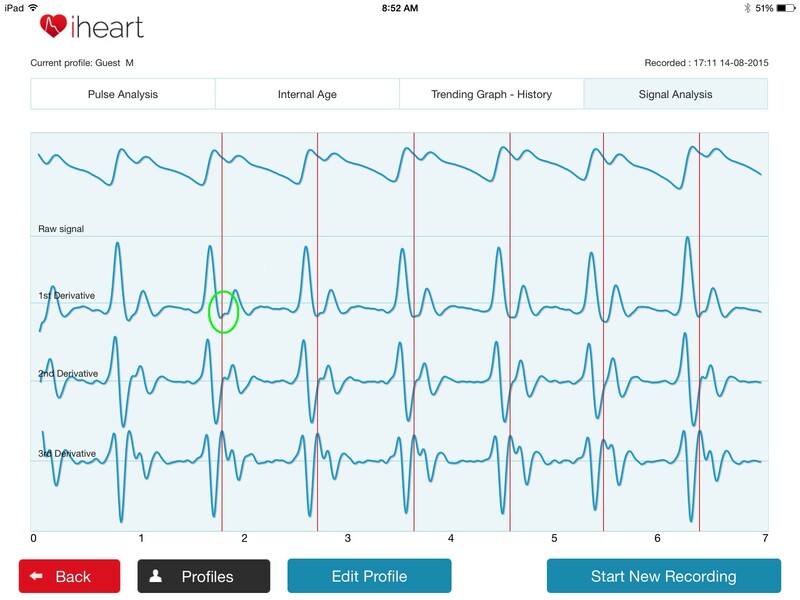 The screen shot below is a screenshot from the iHeart Signal Analysis page that can be viewed on iPads and turned on using iHeart Settings. The red line indicates first appearance of the Aortic Reflected Wave, that is circled in green for one waveform. iHeart identifies subtle changes in pulse shape associated with the Reflected Wave by using analysis of the pulse signal's 1st, 2nd and 3rd derivatives. Shape of the fingertip pulse signal is determined by timing of the Aortic Reflected Wave. This timing depends on the speed with which the Reflected Wave travels along the Aorta. iHeart calculates a Reflected Wave Index that correlates closely with AoPWV. In the screenshot below you can see shape of the pulse wave change on a beat-to-beat basis. This is due to changes in blood pressure as we breathe in and out that affects AoPWV. The red dot shown in each pulse contour identifies onset of the Aortic Reflected Wave. AoPWV is determined by stiffness of the Aortic (affecting volume changes as the pulse wave travels along the walls of the Aorta) and changes in blood pressure. This relationship is summarized by the Bramwell-Hill formula AoPWV = ΔVolume/ΔPressure. Blood Pressure must be considered when using iHeart and when examining iHeart Internal Age readings. Blood pressure varies through the day and is influenced by a variety of factors (e.g. time of day, stress level, physical activity, diet, alcohol, coffee, smoking). As shown in the chart below, even consecutive measurements can result in different measurements. Your blood pressure is lower at night and rises in the morning as you get out of bed. Blood pressure peaks in the middle of the afternoon and begins to decline starting late afternoon. Talking can raise BP by up to 15mmHg. Drinking a cup of coffee will have a similar effect. Changes in BP related to various influences will cause significant changes in AoPWV and Internal Age. It is important to avoid making iHeart readings soon after having a coffee, exercising, eating, smoking and other activities that affect blood pressure. You should try and take iHeart readings at about the same time of the day to account for the hour-to-hour variation shown in the graph above. To allow blood pressure to settle it is necessary to rest in a seated position for a few minutes before starting any iHeart measurements. Resting for five minutes is best but it is essential to rest for at least two minutes. It can be fun to see what effect different activities have on iHeart recordings. You can create a profile called 'After Standing Up' to see iHeart Internal Age values drop or 'After Coffee' to see Internal Age values drop. It is not unusual for one person's Internal Age to vary by as much as 15 years in a single day. 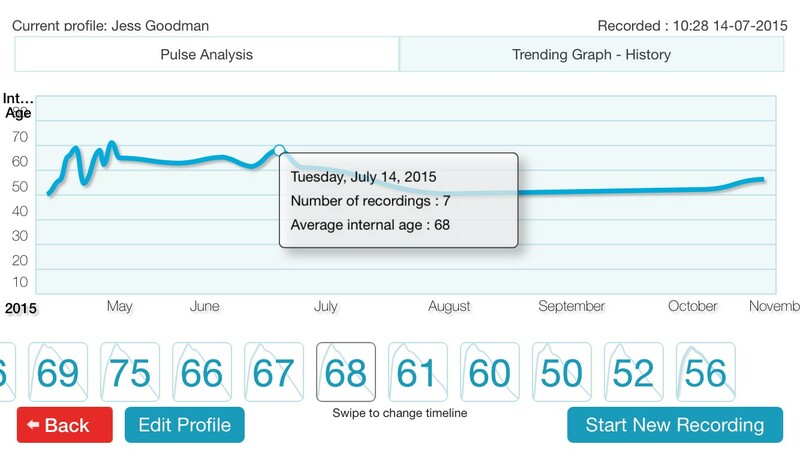 The best way to use iHeart is to follow your Internal Age trend over time. 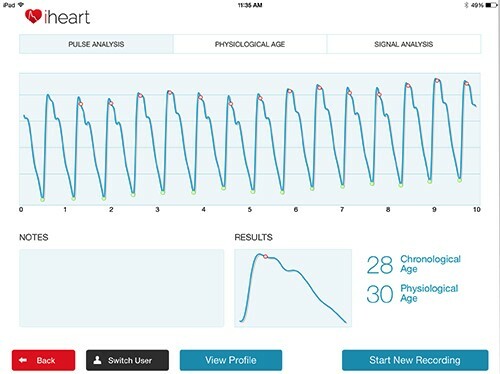 The screen shot of the iHeart Trending screen shown below illustrates how Internal Age varies and how over time the trend can show changes due to attention to diet, exercise and stress management. iHeart Internal Age is a dynamic physiological parameter sensitive to BP and Aortic Stiffness. With a little care iHeart recordings can be made that minimize BP effects and will allow you to follow objective health benefits related to diet, exercise and diet. President & Founder VitalSines. Inc.